Le Ngoc Tuan, Permanent Vice Chairman of the provincial People’s Committee, made the remarks at a meeting with representatives of 20 businesses from the Republic of Korea (RoK) and local enterprises on December 15. He briefed the businesspeople on the province’s potential, strength and resources in such areas as pharmaceutical and agricultural product processing, and tourism, as well as incentive mechanisms for investors. With favourable geographical location, diverse natural resources, distinctive culture and soil and climate conditions, Kon Tum aims to attract investments in high-tech agriculture, herbal medicine, tourism and urban development, Tuan said. Lee Hansu, Director of SJ Rosin Co., Ltd, said Kon Tum has offered support for businesses to operate effectively in the locality. Chairman of the provincial People’s Committee Nguyen Van Hoa had a working session with RoK enterprises specialised in planting and processing Ngoc Linh ginseng and pharmaceutical products. 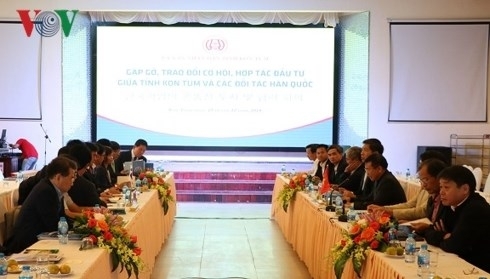 Vice Chairman of the People’s Committee Nguyen Huu Thap talked about the province’s attraction of investments in high-tech agriculture, farm produce processing and husbandry. Meanwhile, Vice Chairwoman of the committee Tran Thi Nga highlighted leisure tourism development in the locality. The event took place within the fourth tourism and culture week of Kon Tum province.